If I had an easy solution for controlling common horsetail (Equisetum arvense), I’d be a rich man. But unfortunately this plant is very difficult to eradicate. And to make things worse, it will grow in just about any kind of soil, be it rich or poor, acid or alkaline, loam, clay or sand, wet or dry. Do note that horsetail is less likely to become establishedin dry soils. You see, its windblown spores will only germinate under moist conditions. However, once the plant has settled in, it will readily tolerate dry conditions, although it will grow more slowly under dry conditions than in moist ones. Typically, the home gardener accidentally carries a section of rhizome from a moister setting to a drier one, sometimes in soil purchased from a nursery, leading to a new infestation. In a garden watered regularly for the benefit of other plants, horsetail will be very much at ease and will spread rapidly. Cultivating or hoeing to control horsetail simply doesn’t work. The more you cultivate, the more it spreads, because cultivating slices the plant’s rhizomes into sections and each tiny section of cut rhizome left in the ground will produce a new plant. Another reason that cultivating doesn’t work is that horsetails also produce tiny tubers, like little “bulbs,”on its rhizomes. Tubers tend to be produced deep in the ground, up to 5 feet (150 cm) down, well out of range of cultivation tools! If you ever decide you do want to try to control horsetail by cultivating the soil, at least make sure you clean your tools before using them in another area, otherwise you risk spreading sections of rhizomes or tubers by accident. That’s why rototillers can be the horsetail’s best friends: not only does do they slice the rhizomes into numerous small pieces and spread them hither and yon, but some almost always stick to the blades, so when you move the apparatus to the next section of garden, you’re seeding horsetail at the same time. A rototiller really needs a good cleaning after each use! Most non-selective chemical herbicides available to home gardeners (Roundup is the best known) are simply not effective against horsetail: it just doesn’t absorb them. Lawn herbicides (selective herbicides) are no better: they’re designed to kill broad-leaved weeds … and few weeds have narrower “leaves”* than horsetail! *Actually, horsetails don’t have leaves at all. The whorls of narrow growths around the main stem are actually branches. One type of biological herbicide, though, is fairly efficient. Herbicides based on soap, vinegar and/or citric acid such as Ecoclear or Weed B Gone will effectively kill horsetail foliage, although not its rhizomes. You therefore have reapply them when the plant regenerates from underground, so they will require a bit of follow-up. Note that using herbicides, even biological ones, in a flower or vegetable garden without also accidentally killing desirable plants nearby can be quite difficult. You can, however, eliminate horsetail by preventing it from carrying out photosynthesis. In other words, by cutting off its only supply of energy: sunlight. If you keep its leaves from being exposed to the sun, the plant will quickly stop spreading and will eventually exhaust itself and die. One method of cutting off the sunlight is to cover the infested section with a black tarp. (You can find this kind of tarp in any hardware store.) You have to leave it in place for 24 months to completely exhaust horsetail: it you remove it after only 12 months, there is usually a bit of regrowth. This method is only really practical when you’ve decided to start from scratch. It’s very difficult to use in an established garden with living plants (perennials, shrubs, etc.). One method you can use in an established garden is to simply cut the sterile stems (green stems) to the ground whenever you see them. Unlike cultivating, which spreads the rhizomes, this causes them to weaken, as you’ll be preventing the plant from carrying out photosynthesis. Start early in the season and recut each time the plant regrows … and it will. By repeating each time a new shoot surfaces, the plant will eventually die. However, this method takes some effort: you may need to cut horsetail back 5 or 6 times the first year …and some stalks may still come back in year 2 and will need to be cut back as well. 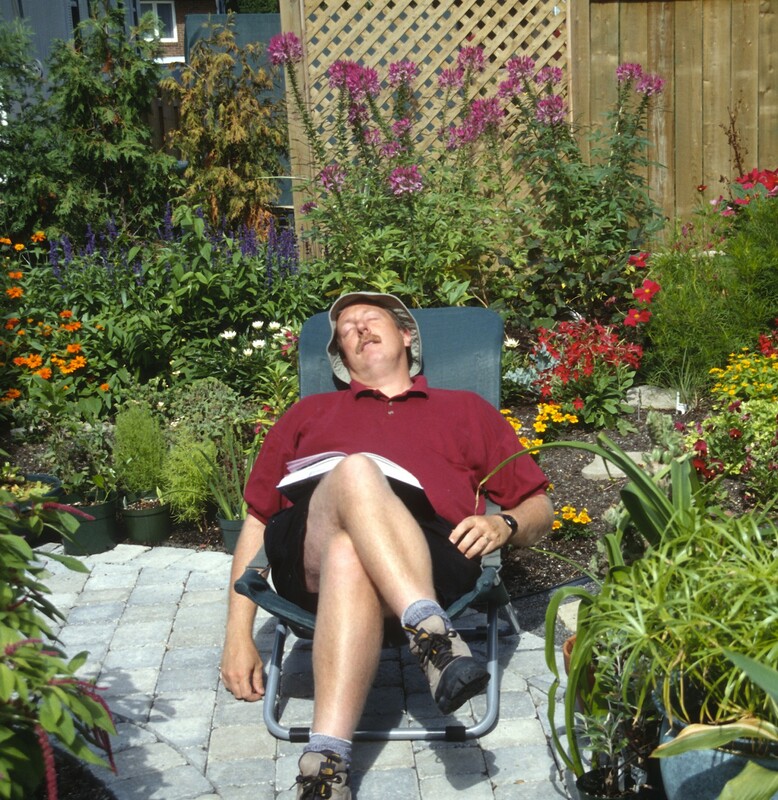 Or try dense planting with taller plants: large ferns, big perennials or thick shrubs, anything that will cut off the sun. Horsetail does best in full sun to partial shade. It weakens in deep shade. By creating dense shade, you’ll be ensuring that it will eventually disappear. It may take 2 or 3 years to get total control … but right from the start, taller plants will pretty much hide the horsetail from view anyway. Out of sight, out of mind! In this technique, dig up all the horsetail plants in the sector, putting their rhizomes in the trash (the foliage can go into the compost). Now, empty the bed of soil to a depth to 1 foot (30 cm) and run it through a soil sifter (easily made from a wooden frame covered with ¼ inch [6.4 mm] wire mesh) before putting it back, removing all the rhizomes you find. Of course, some tubers may be left in the soil and manage to sprout, forming young plants. However, if you pull these out within a few weeks, they won’t have time to produce rhizomes and you’ll be able to stop a new colony from forming. Obviously, this method is most practical for localized infestations. It will be hard to carry out on a large scale. I decided years ago I was no longer going to fight horsetail. I reasoned it was not stealing minerals from my plants (horsetail is not a heavy feeder) and, with its sparse foliage, it lets most of the sunlight through, so my plants still get their share of sun. And unlike dense growing weedy plants such as goutweed (Aegopodium podagraria), it rarely seems to crowd out desirable plants, just to blend in among them. To be honest, I find horsetail attractive. With its beautiful feathery foliage, it can give an attractive misty look to your landscape. If you can learn to accept horsetail as an ornamental, that will save you all the effort of trying to get rid of it. Oddly enough, once I had decided to accept horsetail as a friend, it began to slowly disappear from my gardens. As they matured and became fuller, denser and shadier, there was no longer any room for horsetail. Sometimes (and even often), tolerance is simply the easiest way to go … and it’s certainly the most laidback! An excellent and interesting article as usual. We have plenty of E arvense in our London (UK) garden and I agree that the best thing is to learn to live with it. The opening imge is not E arvense from which it differs in many repects (for example, E arvense has much narrower green, ridged stems) to the point that readers may not find it that helpful for idenification. The picture is clearly of another Equisetum species, possibly E. telmateia (Great Horsetail) which has similar, thick, hollow whitish stems to the plant shown in the picture. It grows much taller than E arvense, mostly in damp, clayey soils. I have never seen it in a garden. Also, on a more minor point: I hate to be a pedant but the appendages to the main stem should not be referred to as `leaves ‘ from which they re botanically quite distinct. Even a casual observer looking at them will see that they are quite different from normal leves of flowering plants (angiosperms) which evolved much later and to which ferns and horsetails are only very distantly related. Pteridologists (botanists who study ferns and horestails) often refer to them as `branches’ (and indeed, in E arvense, they do occsionally branch, though not in E telmateia and many other species), but never as `leaves’. Thank you. I’ll replace the first photo when I have a chance. And I suppose I was (vaguely) aware that horsetails had no true leaves, although that was obviously forgotten when I was writing. I’ll make that correction as well. I like precision as well, but I do make mistakes and appreciate corrections. Thanks! If at first you don’t succeed… I hope this one is all right! And thanks for this. I do like to be precise with photos, but I obviously don’t have an eye for Equisetums! And it’s surprising how many mislabeled photos are on the Web!